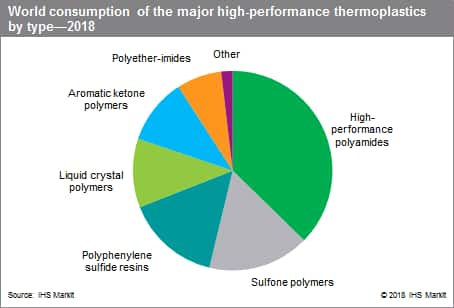 High-performance thermoplastics (HPTPs) are high-priced, low-volume polymers that are sold for use in specialized applications that require a combination of extraordinary properties (the most important being that of high-heattemperature tolerance and performance). Moreover, these HPTPs can replace metal parts and are considered lightweighting materials in industry. These polymers represent a very small subset of the entire thermoplastics industry, which consists primarily of high-volume commodity thermoplastics (e.g., polyethylene, polypropylene, polyvinyl chloride, and polystyrene) as well as medium-volume engineering thermoplastics (e.g., nylon 6 and 66 resins, polyacetal resins, polyethylene-terephthalate, polybutylene terephthalate, polycarbonate, acrylonitrile-butadiene styrene, and polymethyl methacrylate). This report looks at the main HPTPs used today, the major players, and the major markets for each HPTP (neat resin basis), and presents a global overview of HPTPs by major country/region. The major HPTPs covered in this report include the high-performance polyamides of polyphthalamides, nylon 46 and polyarylamides; polyphenylene sulfide resins; sulfone polymers; liquid crystal polymers; aromatic ketone polymers; polyether-imide, and others such as PCT, polyarylate, and other thermoplastic polyimides. The largest-volume HPTPs are the high-performance polyamides (HPPAs). HPPAs are designed for use in applications where engineering thermoplastic nylons are unsuitable such as automotive engine coolant pumps, impellers, valves, and other applications. HPPAs can withstand high operating temperatures and continuous contact with fluids because they are not prone to absorbing water. An important factor driving the high-performance polyamides market is high demand for automotive weight reduction resulting from stringent regulations in some countries for environmental protection and lower CO2 emissions. Moreover, the need for improved strength, enhanced durability, increased thermal performance, and simplified processing is another strong driver for using HPPAs. HPPAs have also gained popularity in the electrical/electronics industry (e.g., handheld devices). Electrical/electronics. Continuing drive for miniaturization, higher temperature generation and greater stresses, consumer demand, increased durability, the pervasive daily usage of mobile electronic devices, and others. Transportation (mainly automotive and aircraft). Replacement of metals with plastics, high demand for weight reduction in vehicles and aircraft, stronger heat requirements, more compact design engineering, increased flame retardant specifications, increased production of electric vehicles, increased aircraft fleet production, greater use of composites; in general, recyclability, greater environmental considerations (increased fuel efficiency, lower CO2 emissions), legislation, and many others. Industrial, including oil and energy. Harsher and more demanding operating conditions, stronger heat requirements, lower systems cost and less maintenance, increased resistance to chemicals, better performance, increased lifetime durability, and others. Medical. Aging global population, stronger heat requirements, biocompatibility for implants, use of more aggressive cleaners and disinfectants, increased sterilization and disinfection compatibility, increased lifetime durability, and others. The high-performance thermoplastics business is international in scope. The industry leaders have worldwide marketing, distribution, and technical capabilities, although in many cases they may manufacture HPTPs at only one or two sites. Companies that do not manufacture locally generally supply product through regional compounding facilities and sales and distribution centers. In addition, they may supplement their marketing activities with regional alliances. Most HPTP producers also compound their polymers with glass, mineral, or carbon fiber reinforcement to add significant value to the base polymer by developing proprietary and/or technology-intensive processing capabilities, as well as to accelerate development into new markets. Historically, the United States, Europe, and Japan were the only countries/regions that had production capability for highperformance thermoplastics (neat resins). Today, countries such as India, South Korea, and China have established their own domestic presence for production and compounding of HPTP neat resins. This is highly favorable in terms of market strategy on both a company and country level. A number of producers have established a presence and joint venture partnerships for HPTPs in India, South Korea, and China. Moreover, in the last decade, many Chinese companies have also added production facilities for HPTPs, including aromatic ketone polymers, high-performance polyamides, liquid crystal polymers, polyphenylene sulfide resins, and sulfone polymers. The European region was the largest HPTP- consuming region (volume basis), at 30% of total global consumption. On an individual country basis, the United States was the leader in terms of global HPTP consumption at roughly one-quarter of global consumption. China was in the second position, having overtaken Japan in recent years. World consumption of HPTPs is expected to grow at an average annual rate of 5% during 2018–23.